Unfortunately, the dress you are looking for (Style: DQ-2459P, Name: DQ-2459P) is no longer available. Delight at prom 2019 wearing this long plus-size prom dress by PromGirl. The embroidered v-neck bodice on the illusion dress features a delicate floral design. The sheer bodice and supportive straps add allure, and an bold open v-back mirrors the v-neck design. The full a-line skirt has a tulle lining which flows dramatically to the floor, while pockets add convenience and fashion. 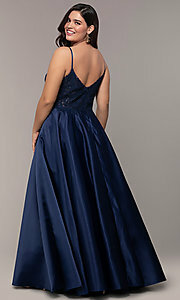 Have a ball in this long plus-size prom dress at prom, gala, or other formal event.